Hardware Wars, a 12-minute Star Wars spoof from 1977, is the highest grossing short film of all time (proving that anything remotely related to the operatic space trilogy turns to gold). As the title suggests, it takes the basic plot of the original Star Wars film and replaces the high-tech gizmos and special effects with low-tech objects you might find lying around the house. The Death Star becomes a waffle iron; R2-D2 is now Artie-Deco (a remote controlled vacuum cleaner). The short is played as a trailer for a film that doesn't exist (it begins with "coming soon" and features an overblown voiceover throughout). The characters from the source material are accurately lampooned: Fluke Starbucker (Mathews) is whiney to the max, Augie "Ben" Doggie (Hale) is a doddering old man, and Ham Salad (Knickerbocker) is cocky. There are some great gags, like the flashlight standing in for the lightsaber (the screen suddenly fills with fog to make the beam visible). My favorite has to be the stuffed version of Chewbacca, the Muppet Wookie Monster, trying to take a bite out of Princess Anne-Droid's (Furgatch) literal cinnamon bun hairdo. There have been many Star Wars parodies since Hardware Wars, and it has certainly lost some of its impact in the last 25 years, but in retrospect, it's a remarkably biting satire of the fervor that followed the debut of Lucas' blockbuster in terms of special effects advances and goofy, kid-oriented sidekicks. The fact that the whole thing is a trailer even forsees the mania that has built up around the release of the prequel films, where seeing the trailer becomes an event in itself. Plus, it has a gag concerning a Darth Vader character whose voice is so muffled by his mask, he can't be understood, and that's damn funny. Image Transfer Review: It's pretty hard to grade the transfer on this disc, simply because it's part of the charm of the film that it appears rather low budget and grainy. That said, I guess I'd call this as cleaned up as I'd ever want to see the film. Lines and scratches aren't much of a problem, and any film grain present appears intentional. Colors are appropriately dull for a film shot on 16mm. Audio Transfer Review: While the back of the box advertises a new "digi re-do 8.2" audio mix, from what I can tell, it sounds a lot like DD 2.0. Like the video, the audio isn't what you'd call reference, but it does seem to represent the original elements. The soundtrack wouldn't be complete without a bit of background hiss, though that element never really distracts. Sound effects are rather harsh, though there is some limited directionality and some slight panning effects as ships fly by. Dialogue is rough but always understandable (except for Darth Nader, of course!). Extras Review: The extras are where this disc really shines. The disc is full of goofy features that, while they don't offer much making-of information on the film, suit the satirical tone perfectly. Two alternate versions of the short are offered, both running about 10 minutes, and in both cases, though they are kind of funny, half the running time probably would have been better. The first is a new director's cut that seems to be mocking the Star Wars special editions (never a big hit with die hard fans) in that it is uniformly worse than the original. It seems to be made up entirely of blown takes and damaged footage, with the original soundtrack intact. The blurry effects shots and illogical edits are kind of funny at first, but after a few minutes, it stops feeling like a joke and starts feeling like a waste of time. The same can be said of the foreign language version, which is the original sketch with a new soundtrack that sounds like nothing so much as the Swedish Chef from the Muppets babbling. Again, it's amusing, but why watch it for 10 minutes? Far more consistently entertaining is the director commentary with Ernie Fosselius. The back of the box sells it as "like none you've ever heard," and that about sums it up. Fosselius parodies (no!) a typical commentary, first in the Criterion style of analyzing symbolism (the iron represents "irony"), before breaking down into incoherent rambling (his inner monologue informs us that he barely remembers filming, but he wants to make up something good). If you want some real information on the making of the short, then The Producer's Comments are for you. Producer Michael Wiese speaks to a group of film students at the Cannes film festival in 2001, offering some anecdotes about the production and offering a story about George Lucas's reaction to seeing the film. Though the talk runs a scant five minutes, it's entertaining and informative. Perhaps the best extra is a very funny short purporting to be an episode of Antique Sideshow. A woman comes on with a film can containing one of the original prints of Hardware Wars and is informed by the appraiser that, while the film is totally worthless, the stickers on the film can are very rare and could be worth as much as $75! Very funny, especially if you watch the real Antique Roadshow (who doesn't?). Another amusing feature is a clip of Fosselius' 1978 appearance on the show Creature Features, where he predates Spaceballs by promoting Hardware Wars merchandise before the film has even been released. Other goodies include a still gallery with a few behind-the-scenes stills and a funny Hollywood Gift Catalogue that offers in-jokey Tinsel Town items like the Sam Goldwyn Talking Clock and a Hollywood Smog Globe. 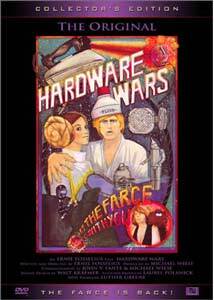 An inspired parody that has started to show its age, Hardware Wars is still a must for the DVD collection of any true Star Wars fan. Laugh, cry, kiss $15 goodbye.